The Worst Witch will fly into the West End for 7 weeks only, over the summer holidays, from 24 July * to 8 September (*all tickets for the 24 July performance are just £20.00!) following its hugely successful premiere at Royal & Derngate and hit UK tour. This new story, adapted for the stage from Jill Murphy’s original books by Emma Reeves (who won a Royal Television Society Award for Best Children’s TV Programme and 2017 British Screenwriters Award for Best Children’s Programme for the televised version of The Worst Witch) was launched last November as Royal & Derngate’s Made in Northampton 2018 Christmas show. 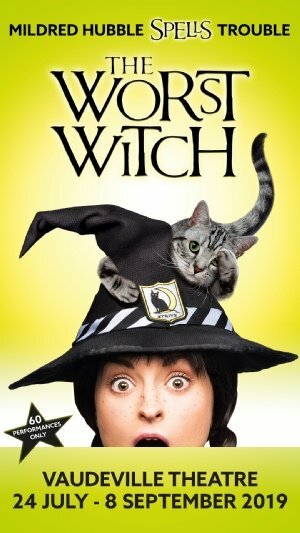 The Worst Witch is the story of an ordinary girl who finds herself in an extraordinary place: a school for witches. Accident-prone Mildred Hubble and her fellow pupils leave a trail of mayhem behind them as they find themselves at the centre of a battle that’s being fought for their future. The Worst Witch is directed by Theresa Heskins (2017 UK Theatre Award for Best Show for Children and Young People) and designed by Simon Daw, with music by Luke Potter. Kenny Wax Family Entertainment, Novel Theatre and Nica Burns present a Royal & Derngate, Northampton Production. Winner of the Royal Television Society Award for Best Children’s Television Programme, and of the 2017 British Screenwriters Award for Best Children’s Programme for the television adaptations of The Worst Witch, Emma Reeves’ screen writing credits include Eve, The Dumping Ground, Young Dracula and The Story of Tracy Beaker. Her stage work includes the Olivier Award-nominated and critically acclaimed adaptation of Hetty Feather (UK tour and West End). Theresa Heskins’ past productions include The Snow Queen, which won the 2017 UK Theatre Award for Best Show for Children and Young People. Her wonderfully inventive and hugely popular production of Around the World in 80 Days was nominated for the same award, in both 2015 and 2017, and will tour to America in 2019. The show is designed by Simon Daw, whose credits include Baskerville (Liverpool Playhouse) and Humble Boy (Orange Tree Theatre). Lighting design is by Aideen Malone, whose credits include A Monster Calls (London Old Vic/Bristol Old Vic) and Peter Pan (National Theatre), and sound design is by Leigh Davies whose recent work includes Spring Awakening (Hope Mill Theatre, Manchester) and King Lear (Old Vic). Original music is composed by Luke Potter (Hetty Feather), aerial director by Vicki Amedume, choreography by Beverley Norris-Edmunds, and illusions by John Bulleid.